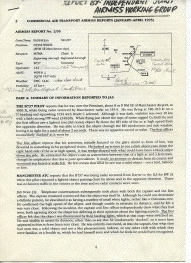 Here are the three pages of the Civil Aviation Authority’s report on the Manchester Airport UFO sighting of 1995 January. Click on each page for an enlargement. Although the CAA declared the sighting unsolved, the basics of the report – a bright streak lasting a couple of seconds, no radar returns and no wake or sonic boom – are entirely characteristic of a bright fireball. 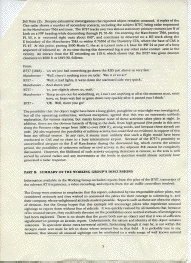 In his report, the pilot described the object as looking like a Christmas tree, which is a typical description of a fireball. 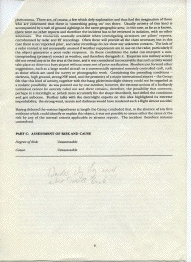 In fact, when I phoned the CAA Press Office to request a copy of the report when it was published in 1996, the press man said to me: “We’ve been discussing this in the office and we think it sounds like a fireball”. So the CAA Press Office had a better idea of the cause than their own Airmiss Working Group. The pencil annotations on these pages are mine. On the final page I have written: “Wonder why they never asked Jodrell Bank”.